The Marketing Tools bundle offers four individual blueprints that work together to define the marketing strategy of a product. Each of the four blueprints are prepopulated with a fictional project called "Moon Rock." In most fields, the example text will be clearly marked in italics with a further indication of "ex:." Replace the example text with your own project details. 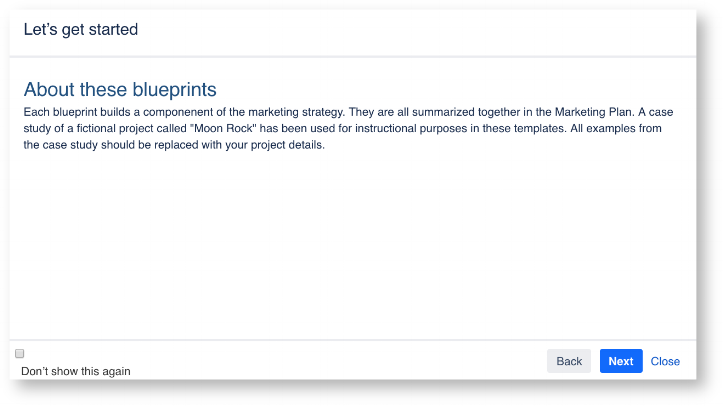 To create your first template, enter your project name into the 'Marketing Tools Wizard' dialog box. In this example, we have chosen a project name of "Moon Rock." Follow this process four times in order to create each blueprint.